One of the most common complaints that we hear about in our Tucson men’s health clinic is headaches. A headache is a catch-all term for any pain occurring in your head. In reality, there are numerous kinds of headaches that can happen in different areas of the head. Some of those aches and pains in your head could be the symptom of a bigger issue. It’s important to know what your headache pain is telling you so you can make the right treatment plan to eliminate your pain. Here are a few common headache types and locations, what they might mean, and how you can treat them. What Is Your Headache Telling You? Pain around the circumference of your head, sometimes especially in the forehead. This is probably the most common headache symptom. The location indicates that it’s most likely caused by tension. The best treatments for this kind of a headache are over-the-counter medications. Reducing your stress level is also helpful and could prevent the headaches from coming back. Try to do some deep breathing exercises during the day to help your body relax. Throbbing pain, sometimes accompanied by sensitivity to light and sound. If you are experiencing this kind of pain, it’s likely a migraine. Migraines usually only affect one side of the head and can become so intense that you may experience nausea or seek immediate medical attention. Staying in a cool, dark, and quiet room may be helpful. Some people don’t get relief using over-the-counter headache medications, and if that’s the case, you’ll want to visit your doctor to determine if there are other options. Pain in the area behind your eyes and nose. This is likely a symptom of a sinus headache. These types of headaches occur when you have a sinus infection or your sinuses are congested. Taking a decongestant or using a nasal rinse should help eliminate the headache symptoms, although it may simply take a couple days to go away on its own. Sharp intense pain behind one eye. These are cluster headaches. They can be intensely painful. While the cause of cluster headaches may be debated, it’s due to irritation of nerves in your face that radiates pain behind your eye. Cluster headaches can come and go throughout the day and usually only last anywhere from 15 minutes to a few hours. There are a variety of treatment options, but you’ll want to visit your men’s health clinic to determine which one is right for you. Pain at the back of your head, radiating into the neck. Pain at the base of your skull could be an early sign of arthritis in your neck. Your spine is made up of individual joints that move and twist, allowing you to bend, walk and run. As you get older, the cartilage in those joints can wear away. The resulting friction can cause inflammation and pain. You don’t have to old to experience it, either; injury and trauma can create the same issue. Over the counter pain medications can help, although you may find more relief with treatments prescribed by your doctor. Headaches when you wake up in the morning, fading during the day. If you wake up with a headache that slowly goes away through the morning, it could be a sign that you are grinding your teeth in your sleep. This does a lot of damage to your teeth, not to mention the pain it causes in your jaw and head. Wearing a dental device while you sleep can help prevent you from doing the grinding motion in your sleep. Dehydration. If you haven’t had enough water recently, a headache is the first sign that your body is thirsty. Drink a big glass of water and see if the pain goes away. Hunger. When your blood sugar drops because your body is ready to eat, you might get a hunger headache. These usually go away once you’ve had some food. Lack of sleep. If you aren’t getting enough sleep at night or aren’t sleeping well, you might experience a headache during the day. Talk to a doctor about ways to increase the quality of your sleep. Headaches are accompanied by symptoms such as dizziness, slurred speech, vomiting, or unusual behavior. Your headache continues to get worse. You are getting headaches more and more frequently. You are relying on medication more and more to control headaches. Our Tucson men’s health clinic is here to help you. 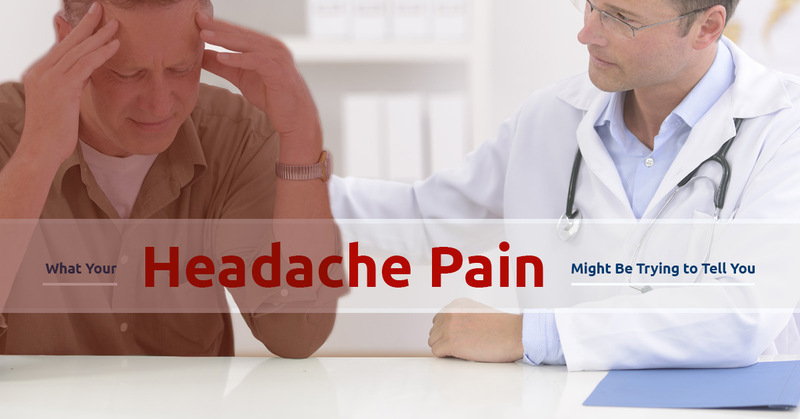 If you are suffering from headache pain, make an appointment with our clinic today. We’ll help you determine the underlying cause of your pain and work with you to develop a treatment plan. Give us a call or contact us through our website to make your appointment now.